What is PEG-MGF or PEGylated mechano growth factor? MGF is a splice variant of the IGF gene which increases stem cell count in the muscle and allows for muscle fibers to fuse and mature. This is a process required for growth of adult muscle. Natural MGF is made locally and does not travel into the bloodstream. Synthetic MGF is water based and when administered intramuscularly, travels into the bloodstream. MGF is only stable in the blood stream for only a few minutes. MGF is produced biologically when muscle fibers are broken down through resistance (weight training). It is a potent factor in muscle growth. 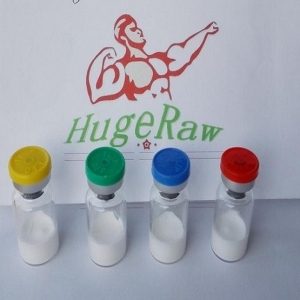 MGF stimulates muscle growth, creates new muscle fibers, promotes nitrogen retention and increases protein synthesis. This compound is commonly used for overall growth of muscle and to promote growth in body parts that are not up to par with the rest of the user’s physique. Results usually depend on dosage. Fat loss and strength increases are not typically seen with MGF’s use (as they are in IGF-1 use).